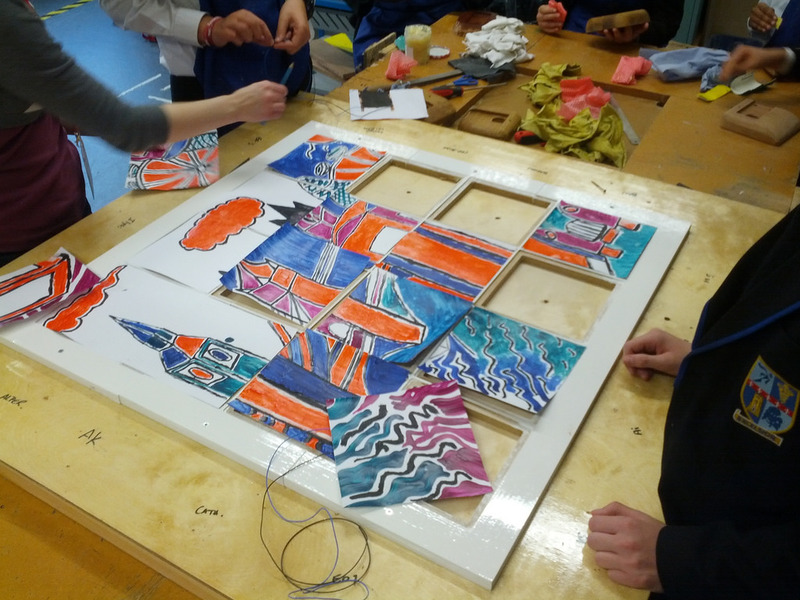 For the second year, Codasign and Lycée Eugène Livet collaborated on an Etch-a-Sketch workshop for Livet's student visit to London. 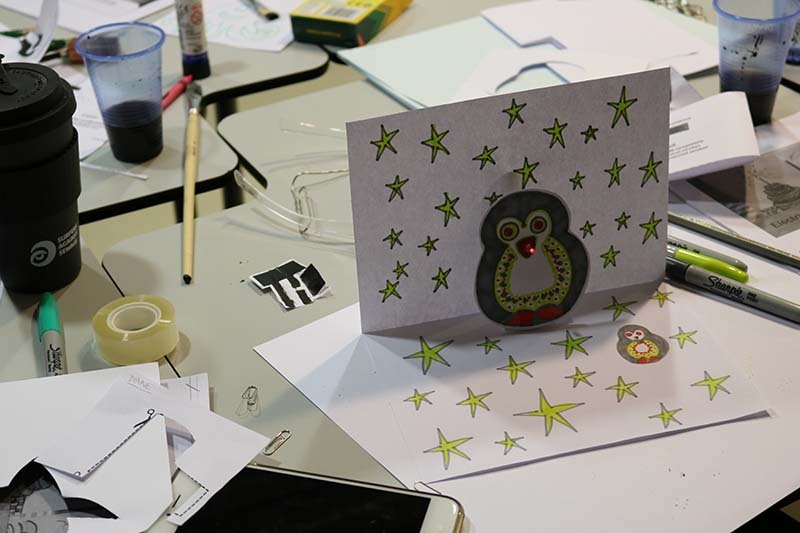 The workshop is not only fun but relevant for the French students. André Cassagnes of France invented the Etch-a-Sketch. Students present their LED infused paper poster. Codasign and King's College collaborated to host an Electric Poster workshop for 30+ visiting university Chinese students. 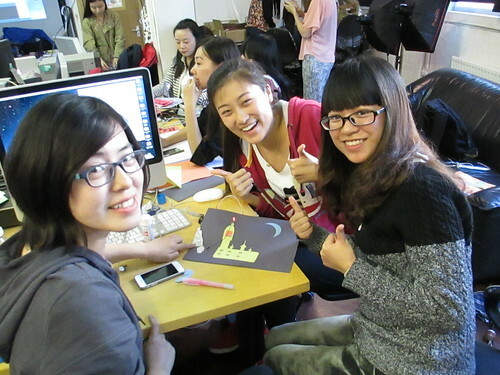 The university students are studying various areas in art and illustration. The workshop was broken into two sections. 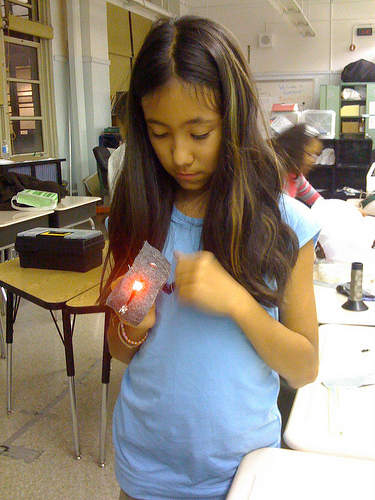 In the first section, I introduced circuit design, Arduino and using conductive ink. In the second section, the students used their new found circuit knowledge to create interactive posters. They were experimental combining traditional electronics and conductive inks in their final creations. At the end, each group presents their poster. The project was developed as part of The Power of the People initiative by Space Studios. 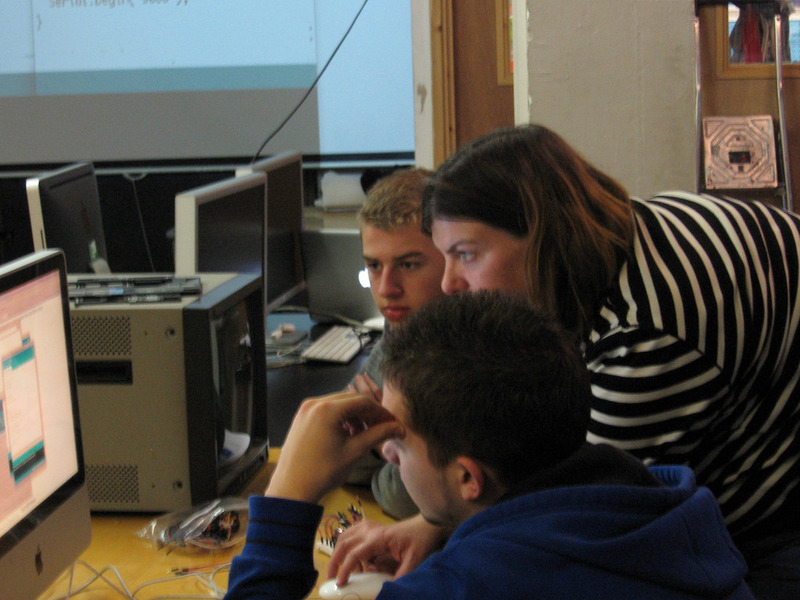 Codasign was brought in to provide the technology support over six weeks with the students. 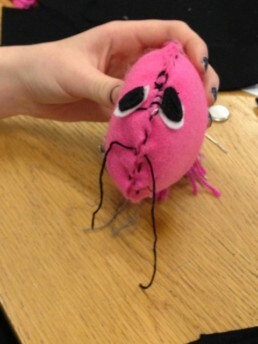 The students were enrolled in the school's product design class. We introduced Arduino and thermochromic ink to the students. 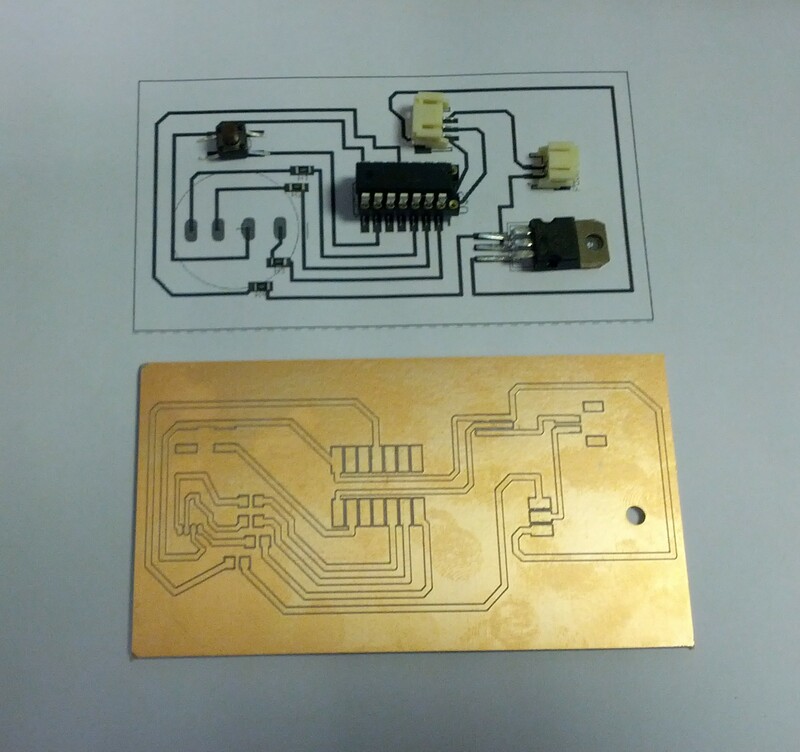 We also designed and produced the printed circuit boards (PCB) with the students. The students conceived of creating a modular image where they each took ownership of a square. When all the squares were assembled a single image was formed. One of the students drew a skyline of London. Each student was assigned a square to draw their interoperation of their section. All the images were outline with black ink. The color was applied with the thermochromatic ink. 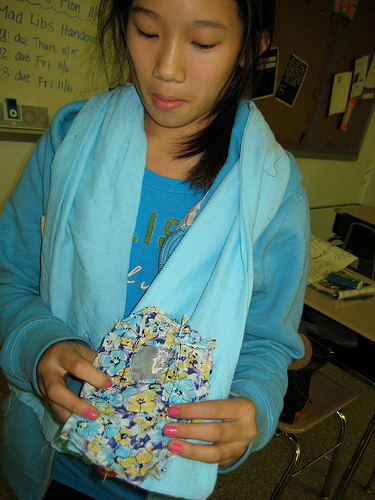 The students also conceived and designed their own button for the their square of the image. 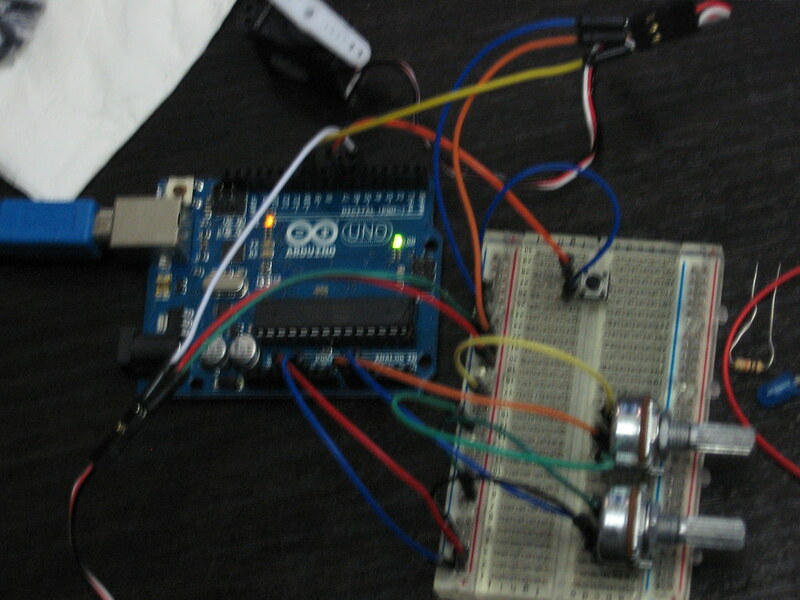 The student programmed Arduino with a RGB LED. The programed the color for their LED when the button was pressed. 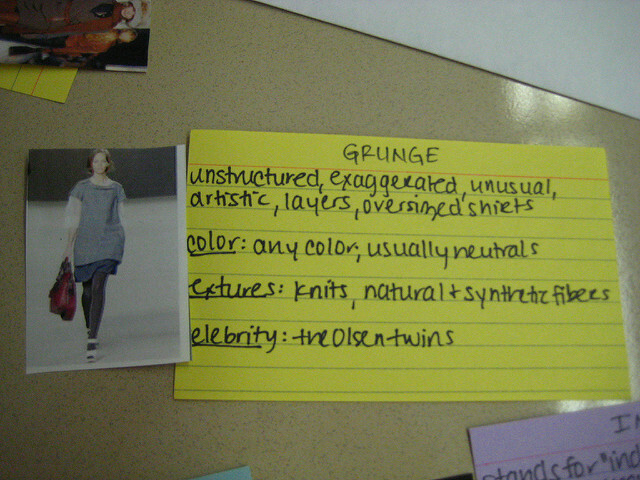 The final project was a gridded image. Each square of the image of connected to a button. When the button was pressed a LED lit up on the button and the color thermochromatic ink was heated up and became transparent. The result is the only the black outline are left. The final project was unveiled at The Power of People #5 exhibition at the The White Building on April 2, 2014. The students of the Lycée Eugene Livet School, Nantes, France came for the second time to Space Studios as part of their annual London trip. 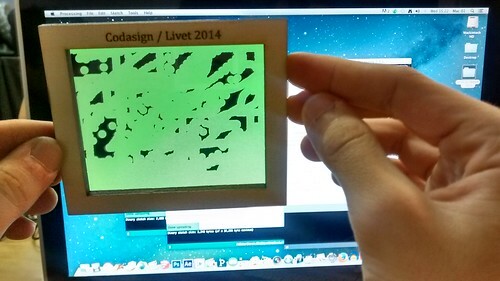 Codasign designed a workshop for the students that combined Processing and Arduino. The school has a technology program that includes teaching Processing and Arduino. The students were a mix of experienced and newbies to both programs. There were two aims to the workshop: 1) teach how Processing and Ardunio can be used to together and 2) help the students understanding of the English centric coding language of both programs. 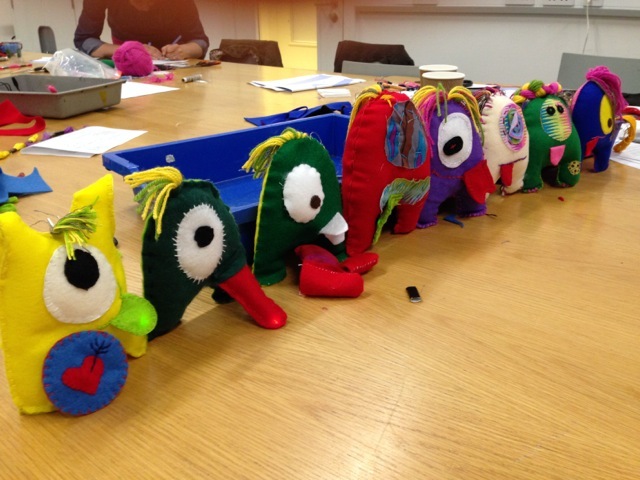 There were two classes and the workshop was run over two days. One day for each class. 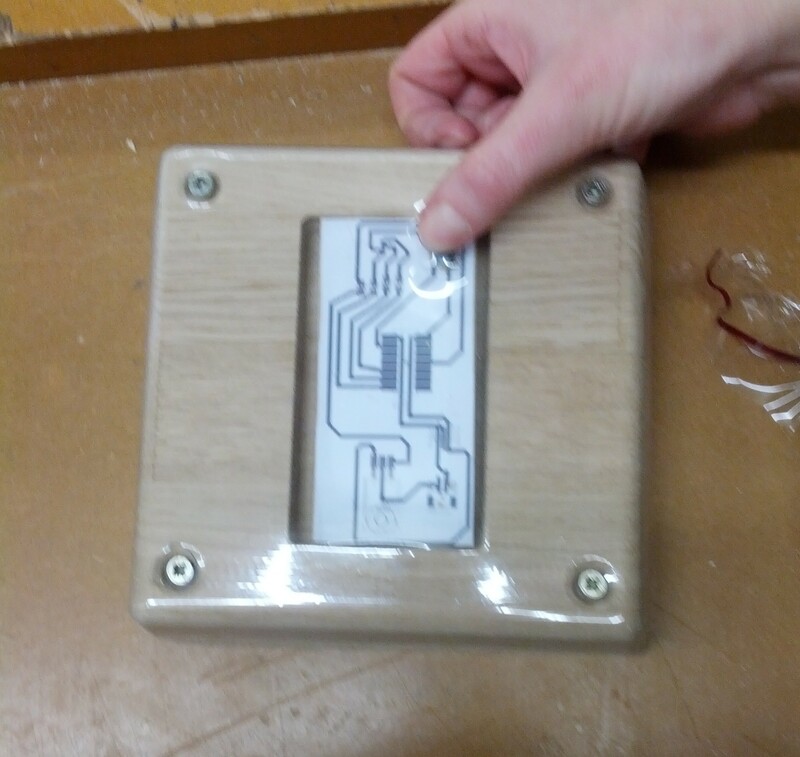 Codasign created an Etch-a-Sketch Project for the students to create. 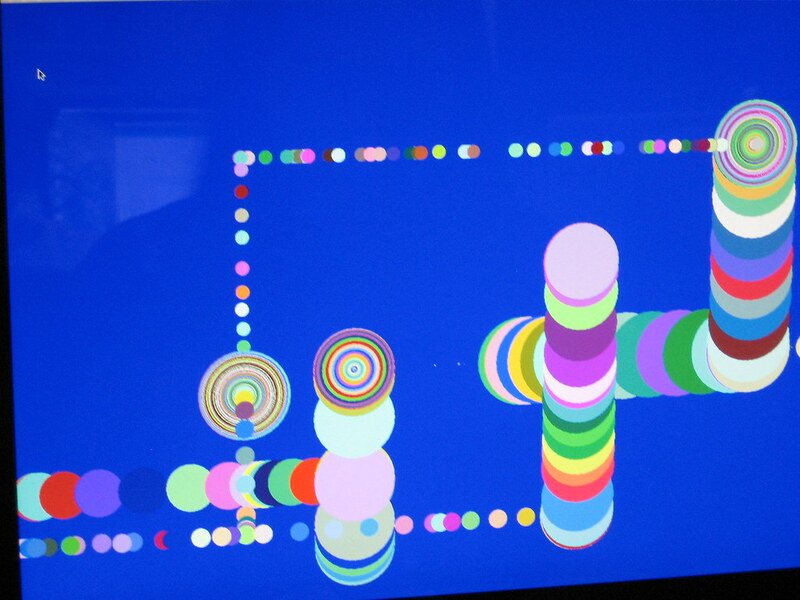 The project creating a drawing program in Processing and Ardunio to create the Physical Knobs to control the drawing on the screen. For more advanced students, who finished the project early, we introduced servos and piezos. Mobo Fashion Pod ran as part of Quest2Learn’s after school program. Quest2Learn (Q2L) is a New York City Public School that is focused on the translation of the underlying form of games into a powerful pedagogical model for its 6-12th graders. As Q2L’s after school program, Mobo Studio is an enrichment space designed to activate kids' curiosity about creativity, design, and mobile technologies. Mobo Studio utilizes a project-based, studio-like learning environment to inspire kids to explore new topics and hone new skills. With a focus on digital citizenship, design expertise and community engagement, Mobo Studio extends Q2L's focus on tinkering, problem-solving, designing, and inventing. At the first session, the FP drafted a code of conduct that was a series of guidelines that everyone signed. Each session consulted the mentor and agreed on agenda that was written on the white board. Each FP was assigned a task to ready the space for work: arranging tables, setting up sewing machines. As new terms were introduced the FPs were encourage to use them as appropriate in conversation. When conflict arose the FP came together as a group to devise a way to resolve the issue(s). Txt Scarf – A scarf with a pocket to store a phone or ipod so that the wearer could access the phone undetected. An added bonus is that it also served as a way to carry the phone when the user was wearing a dress without pockets. Sema (QR) Code Purse – A purse designed with an opening on one side to allow the camera lens of a phone to be accessible. This allowed user to take convert pictures or decipher sema-code posted in the environment. High tech passing notes. LED bracelet – A felt bracelet that has three leds on it. The participants learn about how to control electricity in a circuit by prototyping on a breadboard. Then they build a soft circuit for the bracelet. 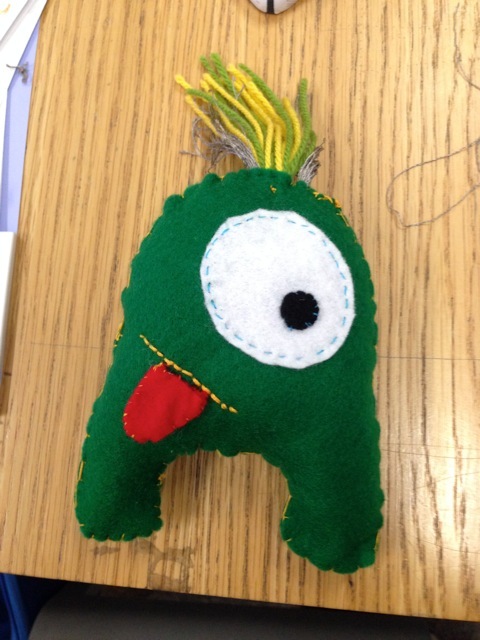 Mobile Quest is a week-long game design camp where 5th graders created games using smartphones. During Mobile Quest students stepped into the role of game designers: playing, analyzing and creating games for their peers to play. Campers worked with professional game designers to experience first-hand how to turn great ideas into great games using smart phones. I was a mentor and a game designer for Mobile Quest camp. As mentor, I had the opportunity to work closely with Institute of Play staff. I was an active participant in the development of the curriculum for the camp and designing the mobile games for the campers to play. We designed three games as an introduction to the three types of mobile technology we wanted them to explore: GPS, Bluetooth, and QR Codes (sema code). Each day of the week was focused around a game mechanic and a mobile technology. 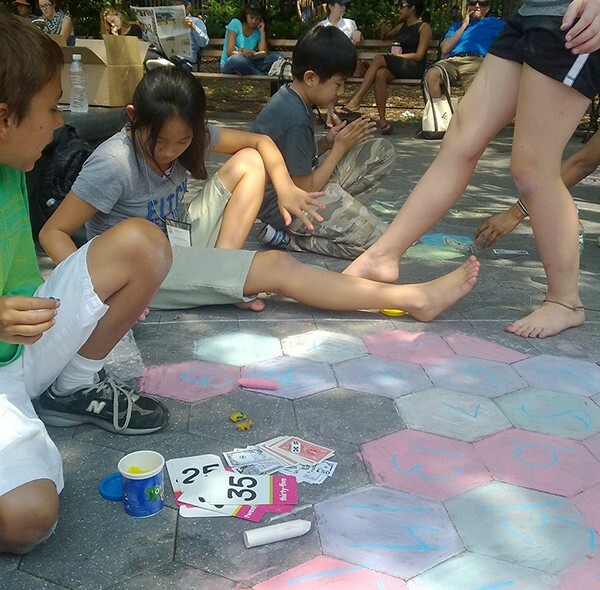 Campers played Mega Scrabble a mapping game that require part of the team to be on the street sending photos and while the other half stay at headquarters to receive the information and create words. We then critique the game and determine what worked, did not work and did not work. The students then worked on redesign of the game. Campers play Silent Semacodes. Each team has one smart phone and there is a maze of random QR codes posted on the wall. The teams use their phones to decipher the code and reveal a keyword. The first team to get to the winning keyword wins the game. We then critique the game and discuss other codes and ciphers. 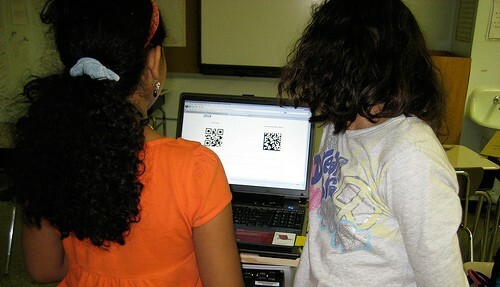 Students experiment with creating games based around codes. Campers play Blue Samurai. Each member of a team battles the person opposite them on the opposing team by a Rock-Paper-Scissors match. The team with most winners out of 3 rounds wins. The losing team must send their avatar to the winning team’s phone. We then discuss trading mechanics in games and impact of technology on game play. Using the knowledge they have learned they begin creating their own games for Games Festival. 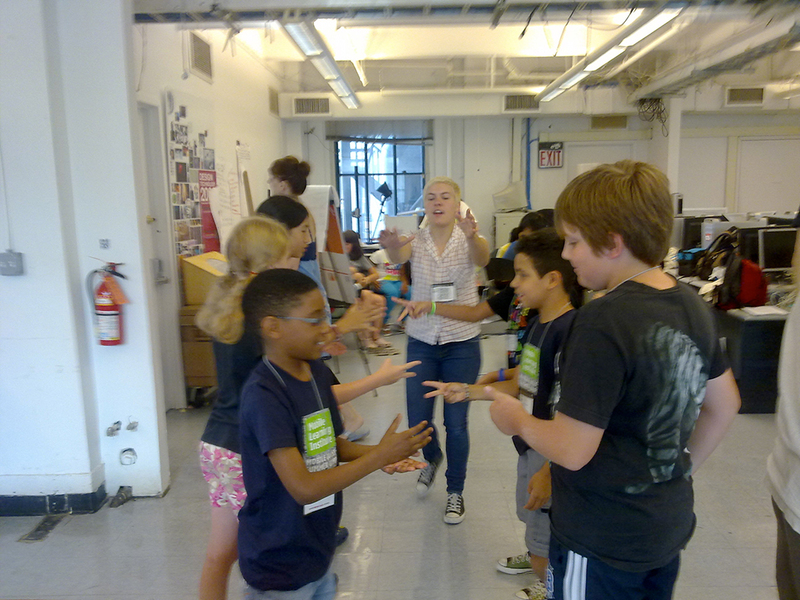 Campers make games from found objects and continue to work on their ideas for a game for the game festival. Students finish up their games in the morning and in afternoon present their games and everyone plays other groups games. 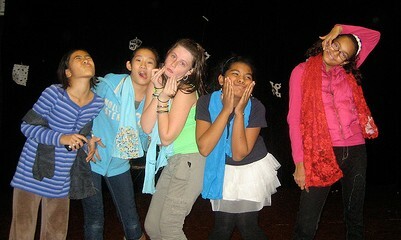 Mobile Quest blog - a play by play of the campers experiences.